The #1 Most Powerful & Least Expensive Marketing Strategy Ever"
During this program we will explore the Prospect Reservoir and Conversion Funnel strategy, and look at the #1 Most Powerful & Last Expensive Marketing Strategy Ever Created" so that you can apply it and begin filling your prospect reservoir. One of the most important skills a business leader must possess is the ability to make decisions. Yet, many are challenged in this area. So, for new leaders and old I've put together a 1-hour webinar on the topic that will provide all senior and emerging leaders a model they can apply to make them more confident in their decision making role. Learn to Create a Strategic Plan that engages, enthuses and empowers your team to step up and achieve outstanding results. It is very dis-empowering to focus on weaknesses and threats with no model to really reach for higher aspirations and results in the old and tired SWOT model. Learn how your organization can S.O.A.R. with this new engaging strategic planning model. During this webcast I will be providing an overview of a very simple and powerful tool I use to help companies create a strategy to build their businesses. This calculator will show you specifically how by focusing in six key strategic areas you can exponentially improve bottom line profits. In this webcast we will learn the concept of the Marketing PIE and Marketing Funnel and discuss in more detail specific strategies for Accelerating the Customer Relationship to maximize your company's profits. Learn how your company can attract hordes of new prospects and customers by offering anywhere from $100 to $500 in Free Gas at a fraction of the value of the Gas Certificates. These are also great for employee incentives and customer appreciation and retention programs. In this webcast you will learn the 3 Myths of Business Marketing that lead to the 3 Primary Causes of Business Failure. We will explore these issues and introduce you to the 5 Power Strategies (C.H.A.M.P) of the Champion Business System. During our monthly webcasts we will review powerful leadership, team development and employee motivation strategies to help new and veteran leaders deliver outstanding results for their organizations. 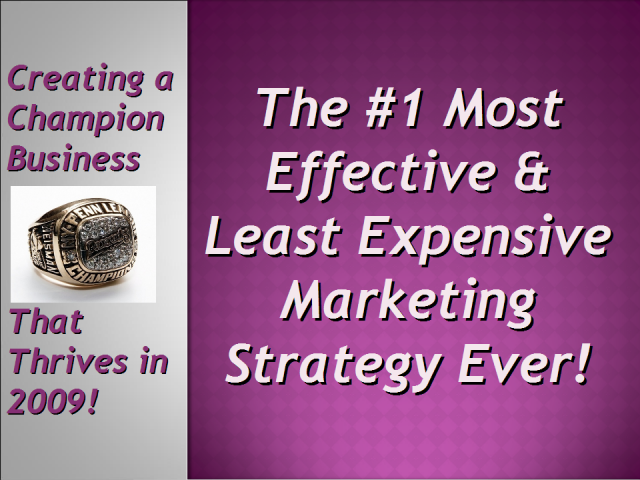 Title: The #1 Most Powerful & Least Expensive Marketing Strategy Ever"